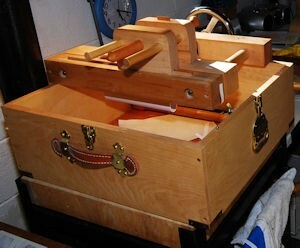 The Bindery In A Box provides a compact set of professional equipment for the hand bookbinder. 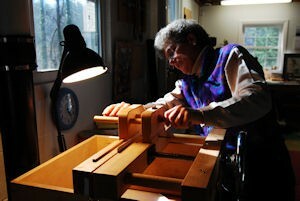 These photos in the gallery below show the Bindery In A Box® both closed and opened. 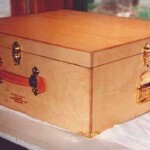 Brass chest handles on both sides, all brass corners, brass cover clasps, brass nameplate, and leather suitcase handle begin to suggest the truly excellent quality work our craftspeople put into every Box. 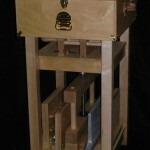 All the tools fit inside the sturdy 9″x18″x22″ wooden box, which is also the frame for mounting the presses. 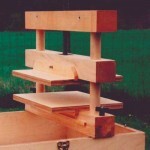 The center-screw press can be mounted on the box in three different positions depending on the function required. You can see the plough resting on the lying press, which is actually three presses in one, converting easily from one function to another. 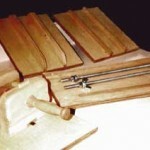 The first position is plough guide, with adjustable wood-handled knife included. Books can be guillotined easily, producing smooth, trimmed edges ready for marbling or gilding. 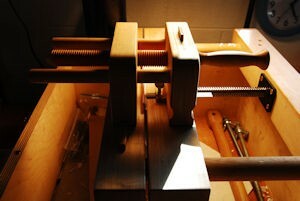 Photo #4 show the brass-edged boards, two platens, and a fully-functioning sewing frame. You see the lying press and plough “in place” on the Box in photo #5. They are held by short metal rods that fit into brass-lined holes. The hand plough has a channel that rides on a raised edge on the press. 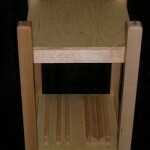 When the lying press is turned over, the backing jaws fit into place exactly and rest on dowels. 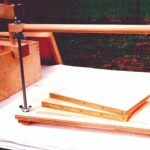 Lying on its side, the press can be used with the plough for trimming edges smoothly for marbling or gilding. 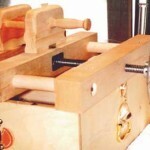 Turned over, the same press can act as a finishing press for holding books during tooling or for other repair procedures. The plough is included. 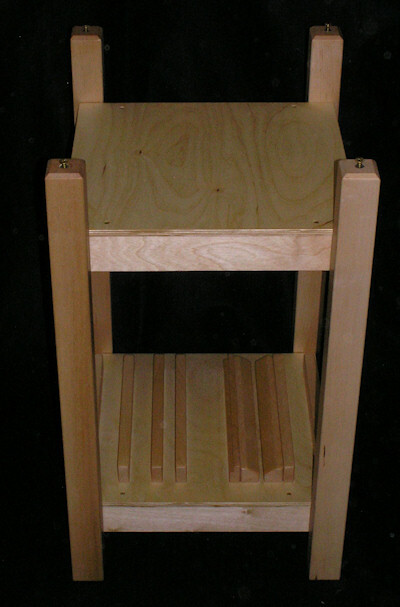 The second press position is job backer, used for rounding the spine. 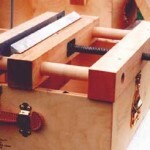 If the backing jaws are set in place the press can perform as a job backer. The metal jaws create enormous pressure, a durable edge, and the proper angle for rounding. The backing jaws are metal reinforced hard wood, the same size and shape as the cast aluminum jaws which are available at an additional fee. 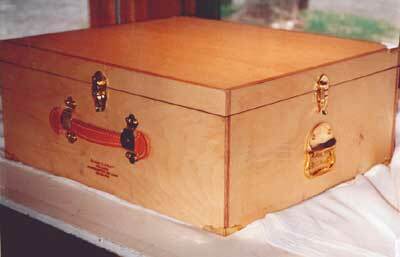 The hardwood backing jaws are guaranteed to withstand rounding and backing and included in the complete box. 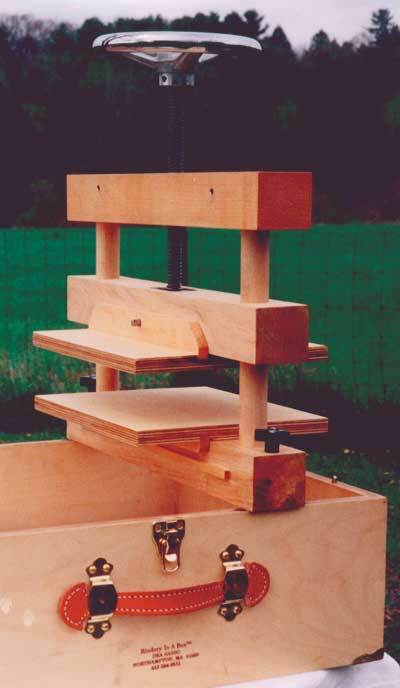 If the press is upright, platens can be quickly attached in order to create a nipping press. 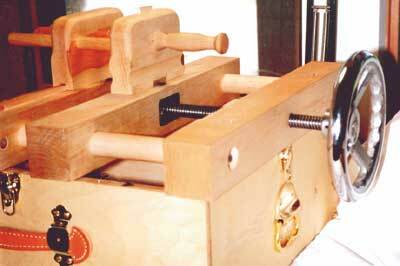 This photo shows the third press position, the nipping press, where the lying press is locked in the upright position with two large black screw knobs. These are hand tightened, no other tools are necessary, and the upper and lower platens are added. 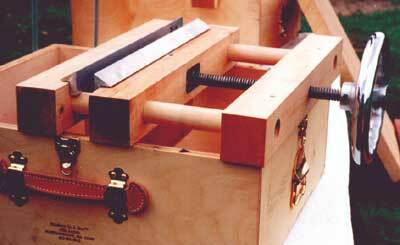 A slide bolt holds the top platen in place, and guide rails and gravity hold the bottom one. 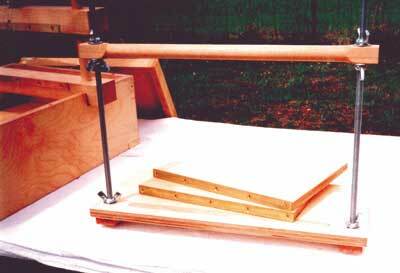 The center-screw press glides smoothly on two dowels reinforced inside with metal rods with screw ends and bolts. 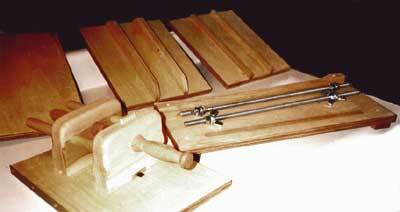 In the box of equipment is also a pair of brass-edged boards and sewing frame. 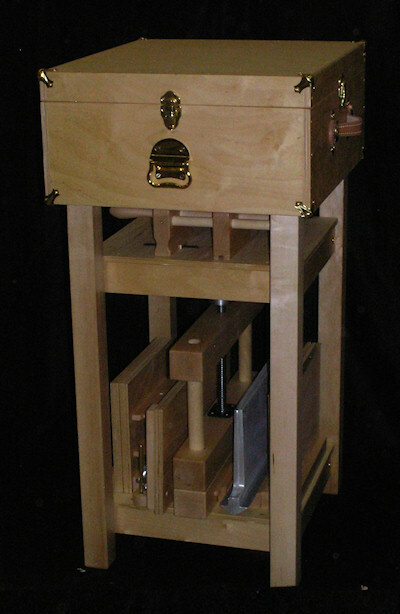 The complete Bindery in a Box® is priced at $2,250.00 plus shipping. The average costs to pack, ship and insure in the US is approximately $130. If you would like a shipping quote in advance, please let us know.